We are delighted to offer for sale this very rare RRP £14,000 custom made to order Ralph Lauren aged brown heritage leather sofa in stunning vintage condition throughout Where to begin! If you like quality seating then this is just about as fine as you will find anywhere. Firstly the sofa itself, the frame is solid mahogany, that’s right mahogany, almost no one uses mahogany because to buy timbers thick enough to make a sofa costs a small fortune, just look at the size of the feet and you’ll gauge just how huge they are. The base is coil sprung, coil springs are hand-tied eight times each, hessian padded supported and strapped, this is the traditional method of making quality sofa bases going back hundreds of years. You usually sit directly on a coil base because it’s so comfortable but in this instance, they have added cushions for extra comfort In terms of restoration, we have deep cleaned hand condition waxed and hand polished it from top to bottom, the leather is thick and soft, its hand stitched and antique brass studded in place. The hide used is 100% premium heritage fully aniline leather, this type of leather is untreated and hand dyed after upholstery, the idea being a very new sofa looks like a vintage piece from day one. The leather is designed to mark so as to add to the vintage look charm and feel Dimensions: Height 87cm Width 221cm Depth 100cm with the back to the wall to the front edge, 102cm to the front of the cushion Please note all measurements are taken at the widest point. 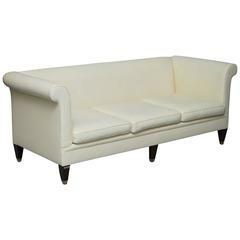 This item is available for collection from our Wimbledon warehouses. Condition: Please view the very detailed pictures as they form part of the description around condition Please note vintage period and original items such as leather seating will always have natural patina in the form of cracking creasing and wear, we recommend regular waxing to ensure no moisture is lost, also hand dyed leather is not recommended to sit in direct sunlight for prolonged periods of time as it will dry out and fade.